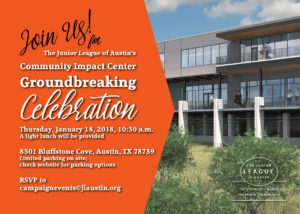 We look forward to seeing you at our Groundbreaking Celebration this Thursday, January 18, at 10:30 a.m. at the site of our new Community Impact Center (8501 Bluffstone Cove). The current weather forecast is pretty chilly, so dress warm and wear comfortable flat shoes. The site is undeveloped so heels are strongly discouraged. There will be a short “shovel ceremony” at 10:30 followed by a lunch in the heated tent. Hot chocolate and coffee provided by Riser Coffee and lunch by Bohemian BBQ. We will have limited parking on Bluffstone Drive and Bluffstone Cove but will have FREE PARKING and SHUTTLE available from the Dell Jewish Community Center, located at 7300 Hart Lane. Shuttles will depart from Dell JCC at 9:30 and 10, and will run continuously from the groundbreaking site to the JCC until 1:00pm. Thank you again for your generous support in making our future home a reality! 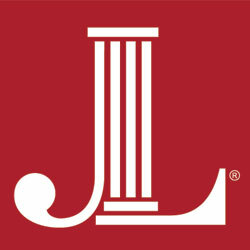 Contact Catherine Mattingly or Candice Mendoza (campaignevents@jlaustin.org) with questions.